Chivda is the most famous Indian snack. This snack is prepared mostly during Diwali festival and is popularly known as Chivda in Maharashtra. 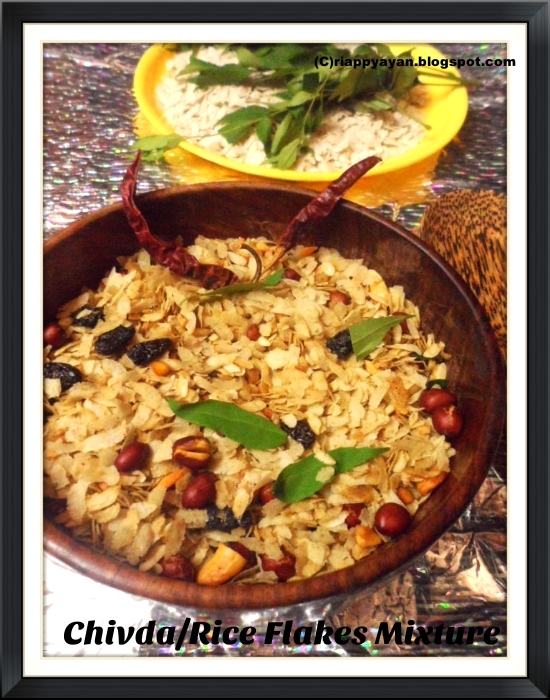 Its made from thin beaten rice flakes(Poha) or even with puffed rice (churmura/muri). This rice flakes mixture is super healthy, as it needs very less oil to make it crispy and I loaded it with raisins, cashew nuts and peanuts. This is super easy-to-make and the good thing is you can store it in an air-tight container for a whole month and munch whenever you feel like. 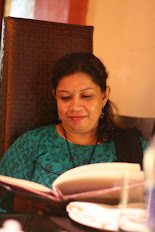 Believe me, I am munching on while writing this post. So addictive, I must say and for me it's guilt-free, as it is home-made and almost oil-free. I prepared this mixture and packed for my husband to munch with tea who lives in some other city for work. Actually he loves this mixture, but I never prepared it at home. So when he is away from me, I prepared and packed with him, as I am missing him a lot. 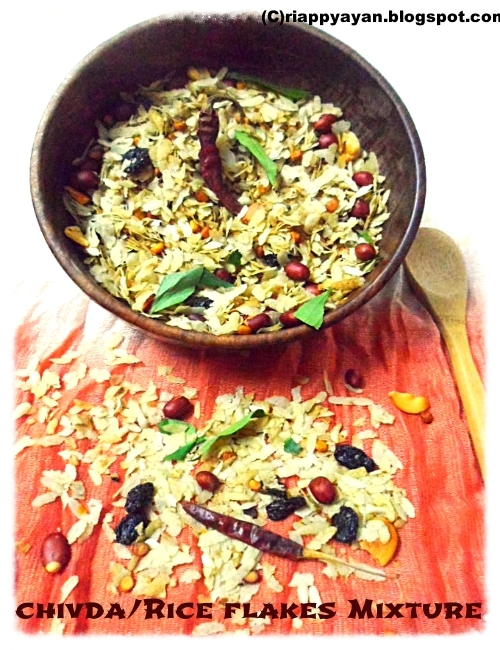 Poha/Chire/Rice flakes : 250-300 gm. Mustard seed : 1 tblsp. Heat oil in a wide heavy-bottomed pan, fry cashewnut and peanuts and when nuts are done, add raisins, stir fry for another 1 or 2 minutes and keep aside. In the same oil, add chana dal first, when they turn light brown, add dry red chillies, curry leaves. Fry curry leaves for a minute, then add mustard seed. When mustrad seed start to crackle, add turmeric, red chilli powder and salt. Stir for few seconds, then add beaten rice flakes or poha in there. From now on, you have to stir it continuously in high flame, otherwise rice flakes can burn. Add in fried cashew nuts, peanuts and raisins. Mix well. Stir it for at lest 5-7 minutes or until rice flakes feel crispy. Absolutely mouthwatering chire bhaja. Perfect tea-time snack. 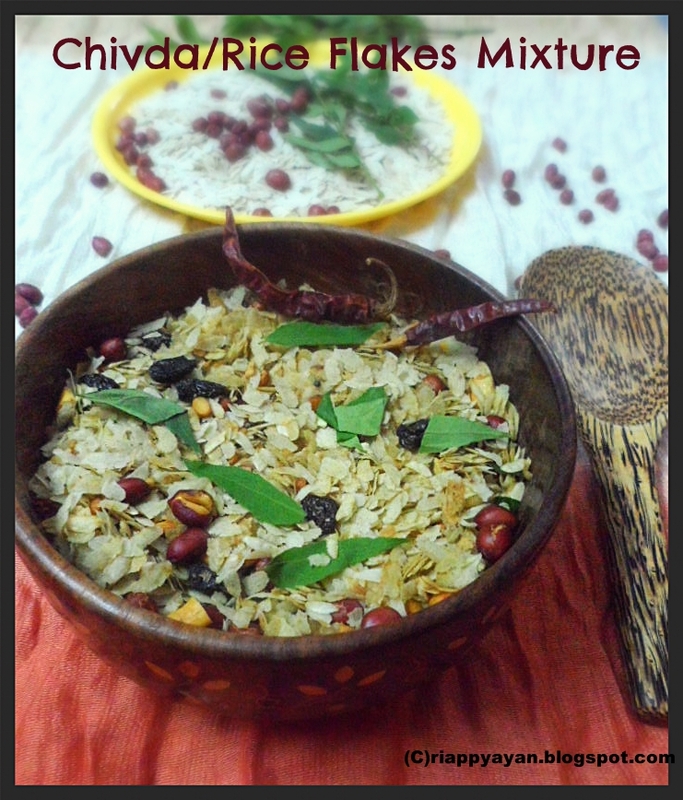 Who can resist to this crunchy munchies,beautiful chivda. No doubt it's guilt free.. Delicious and colorful looking mix. Ebaar nischoi ashbo regularly ... khub bhalo lagche tomar ekhane eshe ... kotodin ashini! Healthy and inviting too. I am adoring the crispy crunchy and spicy splatters inside.